Chinese phone maker Huawei recently announced Android Pie-based EMUI 9.1 beta for its Mate 20 lineup. But in addition to that, the company also announced the next batch of smartphones getting its latest custom skin. 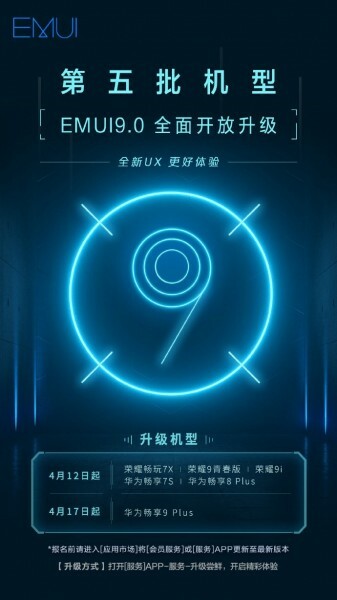 This batch consists of six smartphones which include the Honor 7X, Honor 9 Youth Edition, Honor 9i, Huawei Enjoy 7S, Huawei Enjoy 8 Plus, and Huawei Enjoy 9 Plus. EMUI 9 is available for all these smartphones, except the Enjoy 9 Plus which is slated to get it starting April 17. You can get EMUI 9 on these smartphones through the member services app by selecting the "Early Adopters" option. Has anyone got an upgrade to Android 9 for p smart 2017? i didn't get the emui 9 on my honor 8x wtf! !